DRON with smartphone creates super flying experience. One-click commands of UNLOCK, TAKEOFF, RETURN make simple and smart flight. 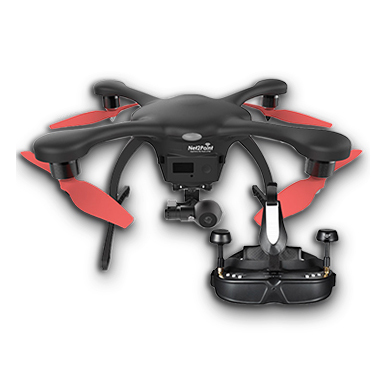 Tilt mode, auto follow mode, and point-to-point flying empower your stunning flying experience. Out-of-Sight Flight, 1000m Communication Distance. 2.4G spread spectrum technology provides strong antijamming capability to ensure the minimum power loss. Compatible for both Android and iOS, Multiple Control Modes Supported. Anyone can fly DRON in 30 seconds. One-click commands of make DRON super smart and easy to fly. Two control modes available: horizontal interface version is point-to-point flying APP, while the vertical interface version is for Avatar 3D title mode. You can play multiple modes with one DRON. Configure device through wired/wireless network. Support Pan and Tilt, control viewing angle freely. Support sound wave and wire configuration.